Commentary: Could Cuban Cigars Save the Non-Cuban Cigar Industry from the FDA? In April 2014, the Food and Drug Administration (FDA) took the first major step towards invoking its authority to regulate premium cigars. At the time, it seemed likely that by the end of 2014—if not certainly in 2015—the FDA would finalize its rule subjecting cigars to FDA regulation, including a pre-approval process for cigars introduced after 2007 that would cost cigar makers up to a projected $400,000 per new cigar brought to market. The comment period for the proposed regulation closed in August 2008 after nearly 55,000 submitted comments, with over half of them from cigar smokers concerned about the impact of the new regulations. Since then, the rule-making process has slowed considerably. It took over a year after the close of the comment period for the FDA to submit a proposed rule to the Office of Management and Budget (OMB), which finally took place last fall. Normally, the OMB review process is completed in 90 days, but nearly six months later there has been no further action. Now, rumors suggest the process is frozen. So why the delay? The most likely answer may be Cuba. 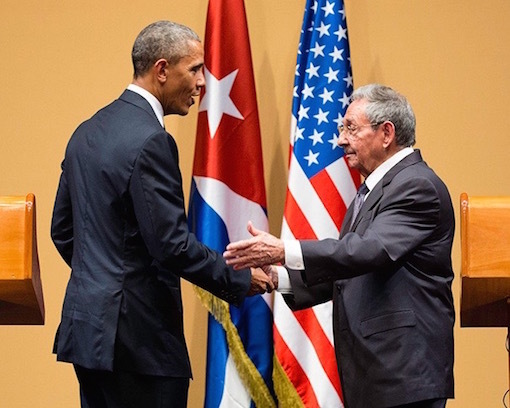 After seemingly ignoring Cuban-American relations for most of his presidency, President Obama has taken significant steps toward normalizing relations with Cuba in the final years of his final term, culminating with the historic visit to Cuba earlier this month. With Cuban cigars being one of Cuba’s most notable and economically important exports, one can reasonably infer that thawing diplomatic relations may be throwing a wrench into FDA efforts to regulate cigars. For non-Cuban cigars, the impact would be huge. For Cuban cigars, none of which can be legally sold or marketed in the U.S. as long as the embargo remains law, the impact would be total. One open question about the FDA rules under either option is how cigars introduced after the 2007 cutoff, but already on the market when the rule goes into effect, would be treated—especially those introduced before the FDA took any action towards regulating cigars, or even before the bill authorizing the regulation was signed into law in 2009. Immediately pulling those cigars off the market would be extremely disruptive, not to mention impractical and grossly unfair. Therefore, a grace period where the cigars could remain on the market pending an application for FDA approval seems likely. Of course, non-Cuban cigars, like Cuban cigars, that are not currently on the market wouldn’t be helped by such an accommodation, and options for specifically exempting one country’s imports but not another would not be justified by the legislation (and also could violate international trade commitments, not to mention basic fairness). For Cuban cigars, the majority of which would probably meet the premium definition, especially with likely price hikes due to increased demand should they become legal in the U.S., option two would allow Cuba’s most famous product to be sold almost immediately if and when the embargo ends. Option one, on the other hand, would keep Cuban cigars off the world’s largest cigar market until they undergo the pre-approval process. Considering that the FDA has taken years to rule on a small percentage of the pending tobacco products already waiting for FDA approval, that wait could be almost indefinite when they go to the back of the line after thousands of non-Cuban cigars. Unfortunately, indications are the FDA has resisted option two (a purported leaked copy of the rule the FDA transmitted to OMB didn’t include a premium cigar exemption). Further rumors suggest the White House and OMB favored an exemption for premium cigars while FDA opposed one, which has contributed to the likely delay at OMB. All of which brings about more questions than answers. But now there’s certainly a compelling case that changing relations between Washington and Havana, and the potential impact on Cuban cigars, could be a significant reason for the delay in implementing a final rule regulating cigars. If true, then possibly only the president’s unilateral desire to re-establish trade with Cuba is stopping the U.S. government from devastating American cigar retailers, non-Cuban cigar companies, and the tens of thousands of people in the Dominican Republic, Honduras, Nicaragua, and elsewhere that depend on making cigars for the American market. What does it say that the only thing that might save non-Cuban cigars is the desire to not harm the Cuban government-owned cigar industry? In many ways, the question is as troubling as the answer. But given the destructive impact of FDA regulation on cigars, any reason for delay or possible reprieve would be most welcome. But Obqma intervenes to protect Communist owned Cuban Cigar company. That sums up our president and explains Trump’s popularity. So, regulations developed and proposed under Bush go to sleep for 7 years under Obama. And when they do start moving, Obama links them to a foreign policy priority (normalizing relations with a hostile country 80 miles away) which has the effect of moving them in the more permissive and less repressive of the two options. And all of this proves Obama is a freedom-hating tyrant who cares more about Cuba than America. Plus, go Trump. As someone who’s been on the inside, it doesn’t really matter if FDA opposes, as their authority is more or less purely as subject matter expert and ends where political considerations begin. OMB and the White House will take their comments and recommendations under review and purportedly factor them into whatever decision they ultimately make on the rule. I agree that Cuban relations could be factoring into this dynamic, and, if so, the decision is completely within the hands of SES-politicos, not the FDA wonks. I still say it is possible, although unlikely, that the cigar regs could end up in the lap of the next administration. Despite years-long pressure from health groups, the White House has not determined how FDA will regulate menthol cigarettes and the second attempt at graphic cigarette warning labels has not even begun. I believe the poll results are more reflective of the majority than these posts. Trump is a bad joke.